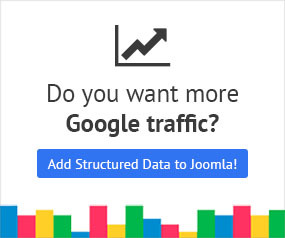 Google Structured Data integrates perfectly with the EasyBlog component and enables you to add structured data and specifically the Article Content Type to your EasyBlog pages. Find the "EasyBlog" Integration in the list and make sure that it is enabled with the green checkmark indicator as shown in the screenshot below. Let's see how you can add the Article Content Type to EasyBlog pages. From the Components menu, choose Google Structured Data, nagivate to the Items section and click on the New button to create a new Structured Data Item. On the next page, you will see the following 3 options where you will need to select Article Content Type and the EasyBlog Integration as shown in the screenshot below. Post Target specific EasyBlog Articles only. Category Target all Articles assigned to specific EasyBlog categories. Remember, in case you don't enable any publishing rules, the structured data will be generated on all EasyBlog articles. The Structured Data is generated only in the Article Entry View of the EasyBlog component where a single Article is displayed. The Category or List views are not currently supported.